Every year I enjoy teaching Haskell to Informatics 1, but this year was spectacular. 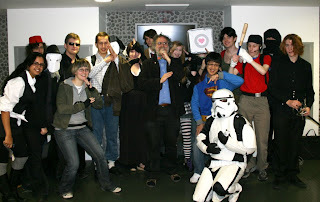 The students decided to attend the last day of lectures in fancy dress, and brought cupcakes decorated with lambdas. This year's programming competition was also exceptional. Every year there are one or two stunning entries, but this year we felt we had to award prizes to no less than seven!